In perhaps the most crowded field around, the ID:Core Stereo 100 gives the established competition a hard time, and it's astounding value for money. 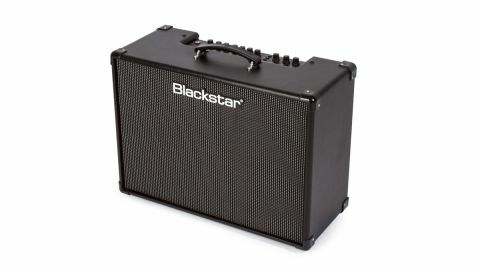 The ID:Core range of portable practice and recording amps has proved a very popular one for Blackstar, and now it's grown to include a pair of combos more suited to live use, but still offering all the features that make the ID:Core amps so popular with home users. The new combos are compact and lightweight, but with 100 and 150 watts of power to get your point across. Here, we're looking at the ID:Core 100 combo, which uses a pair of special design Blackstar 10-inch loudspeakers to deliver 50 watts of power per channel in Super Wide Stereo. The ID:Core 100 looks just as smart and purposeful as its smaller brothers and carries over all the familiar ID:Core features, together with a new polyphonic octaver and a looper. There's also an effects loop at the rear, so you can combine outboard effects with the ID:Core's built-in studio-quality reverbs, delays and modulations, alongside the six programmable amp voices and up to 36 patches. - you can even combine them and use the octaver to add bass parts on the fly. There's also a handy footswitchable undo function on the looper, so you can backtrack on a part that's not quite right. The included USB recording interface means the ID:Core 100 is still just as handy for home and studio use - despite the higher power, it's still very portable, weighing in at just over 12kg. The front panel editing and patch store/ recall is no different to the other Core amps, while the really clever stuff happens in the virtual domain, courtesy of Blackstar's Insider software app, which has enhanced editing capabilities, together with extra features, including offline patch storage and a phrase trainer that lets you loop and time stretch to your heart's content, perfect for getting to grips with tricky licks. While purists will always lust after valves, the power of digital signal processing has put all kinds of possibilities into the hands of every player, from beginners to pros. As software and hardware continues to develop, the quality of sounds has improved no end, while Blackstar's app builders have come as close as anyone to providing the perfect interface that's intuitive and, above all, fun. The best news of all is that this amp comes at a price that would have been unthinkable a few decades ago, and it includes a handy two-button footswitch that gets you straight into using the looper.